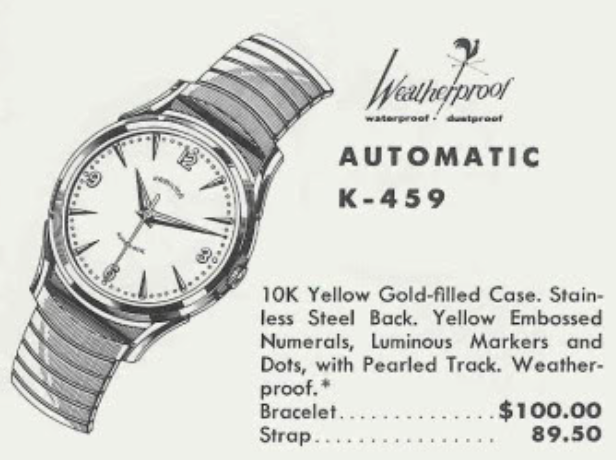 1960 was a banner year for Hamilton Automatics... the Automatic line was in full swing and the Accumatic line was gaining ground and the Thin-o-matics were also new on the scene. There were quite a few models with only a one-year production run and one of them was the Automatic K-459. When I first located a K-459 it was fairly easy to identify. If you've followed my blog you know that gold filled models typically start with a 4. Stainless steel starts with 5. If the gold or gold filled model has a stainless steel back, the second digit is a 5 too. Since the K-459 has a 10K yellow gold filed case with a stainless steel back, I knew that it would be a K-450-something. Of course, there is an exception to every rule and since there are more than 10 K-series with stainless steel backs, the last model is a K-460. Like the majority of the K-series automatics, the K-459 features a 17 jewel 661 movement inside. I recently picked up a K-459 and when it arrived is was very dull - finish-wise that is. It was not shiny at all and more of matte-finish. I was concerned at first that perhaps it was just heavily worn but it turned out all it needed was a good buffing. The stainless steel case back is easy to remove if you have a tool to fit the notches in the side. Despite the blah outside, the inside of the watch is still bright and shiny. It will be even more so after a trip to the spa. Everything is cleaned and dried before being reassembled. You can see the bezel is much shinier now. This movement has two challenges when it comes to reassembly. One is to get the large train bridge back into place - it requires positioning three wheels at exactly the right place at the exact same time. The other is to put the rotor carried back on - as several small pivots have to be lined up for that too. In this shot the train bridge and barrel bridge are reinstalled and all that's needed now is to put the balance back in place. The now running watch goes onto the timer to see how it's running. Not too bad... just a little fast but that's easy to adjust with the regulator. There - that's much better... good beat rate, beat error and amplitude. I'll put on a new crystal to protect the dial and hands. A high dome PHD-style crystal is my typical choice for sweep second models like this. Everything goes back into the case and a brown teju-leather strap completes the restoration. The K-459 reminds me of earlier 400-series models from the 1950's. This one is much less common though, having only been produced in 1960.